Matchroom branch out into Europe this Friday night, as the Italian arm of their operation makes its debut with a show in Florence. It’s an Italy v England feel as the three fights on the card are all Anglo-Italian affairs. At the top of the bill, there’s a European Title match, and there are also two fights with WBC Silver Titles on offer to the winners. Sky Sports is the UK broadcaster. Here I preview the main event and the support acts. The Teatro Obi Hall in Florence is the setting this Friday, as Eddie Hearn moves into the European market, bringing his Matchroom product to Italy. Top of the bill is a clash for the vacant European Super Lightweight Title between Torino resident, Andrea Scarpa, and a former British and European Title challenger in Malmesbury’s Joe Hughes. 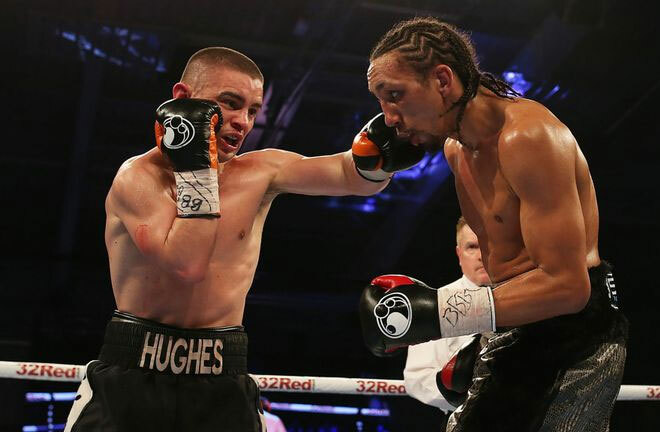 Hughes challenged for the very same Title in December 2017, dropping a points decision to recent World Boxing Super Series participant, Anthony Yigit in Leicester. He also has good championship distance experience, having been ten rounds five times, and twelve rounds three times during his twenty fight paid career. What’s more remarkable about Hughes, is that he was born with a condition known as Erbs Palsy, a condition that affects the main nerves in the upper arm, and as a result, his right arm is three inches shorter than his left. Despite this, in December 2015, he became English Champion by outpointing Anthony Upton, knocking him down twice in the process. He put in a spirited performance in defeat against Jack Catterall five months later, losing out on the cards. 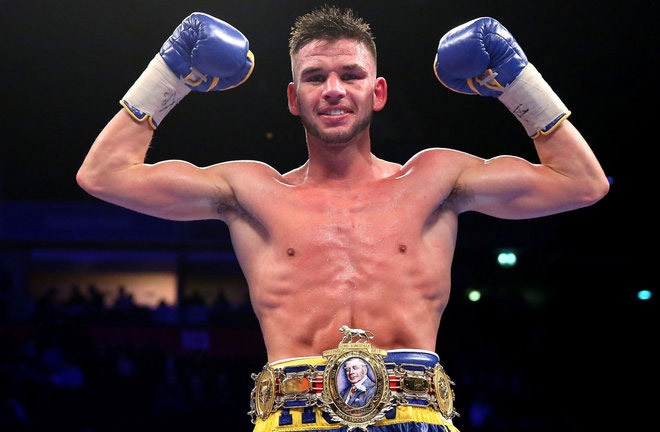 He rebounded to defend his English belt against Andy Keates (Unanimous decision) and then came agonisingly close to becoming British Champion, but had to settle for a three way split draw with Tyrone Nurse in a scrappy affair in Leicester in April 2017. Next came the Yigit reverse, and since then, he has boxed an eight rounder in Bristol, retiring Ruben Rodriguez in six in February. In Andrea Scarpa, this should be an even contest for Hughes. Hs started his career with two losses in his first three fights, but has matured into a decent continental operator. After fighting exclusively in Italy for the first five years of his career, Scarpa ventured to the O2 Arena, London to win the WBC Silver Title, stopping John Wayne Hibbert in six rounds. 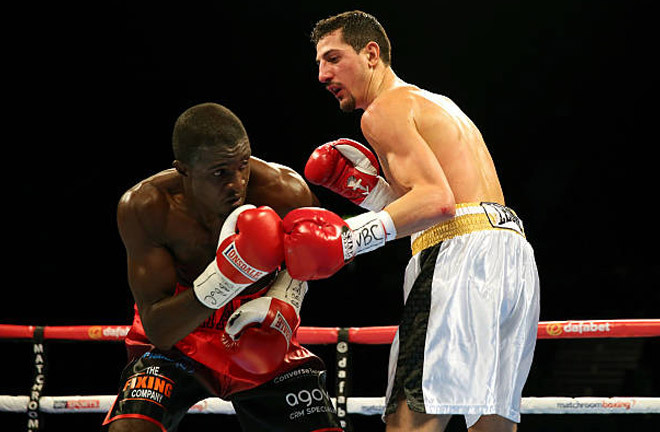 He shipped this in his first defence, as O’Hara Davies won every round at Wembley Arena to relieve the Italian of his belt. Two six round points wins followed before Scarpa travelled to France, losing a points decision to Franck Petitjean for the EU Title. He has fought once since, a six round points win against Luka Leskovic in May. This is a very well matched fight, and Scarpa will start as slight favourite due to his home advantage in his native Italy. As both men’s knockout percentage is under 50%, I expect the fight to go the distance. Scarpa will look to make it a technical fight, while Hughes will look to force the pace. Ultimately, with the home comforts, I expect Scarpa to take a disputed points win. There are two other decent fights on the card. Martin J Ward (20-1-2, KO10) continues his rebuild following a surrender of his Commonwealth and European Titles to James Tennyson in May. He has a tough assignment against Devis Boschiero (46-5-2, KO21) for the WBC Silver Super Featherweight Title. A European Champion himself in 2012/13, and a World Title challenger, Boschiero regained the European Title in May this year, outpointing Faroukh Kourbanov in Milan. The Italian is reaching the twilight of his career at 37, and is coming off a shock six round draw with the then 8-14 Maycol Cuevas in July. He was stopped by Stephen Smith in 2015 in six rounds in what remains his only stoppage defeat. Ward will look to kick on now in what has been a stop start career. A Lonsdale Belt holder, Ward added the European Title with a sixth round knockout of Juli Giner in December last year. After knocking James Tennyson down with a body shot in the second round at the O2 Arena, only the bell saved the Irishman from defeat. Tennyson rallied to score two knockdowns of his own in the fifth, and Ward was unable to continue. He shook off the rust by knocking out Mohammed Kambuluta out in two last month. I think the pick is for Ward to come through on the cards against the tough Italian, using his sharp Boxing skills. Boschiero’s main hope is to frustrate Ward, but I feel he can’t sustain this for twelve rounds. 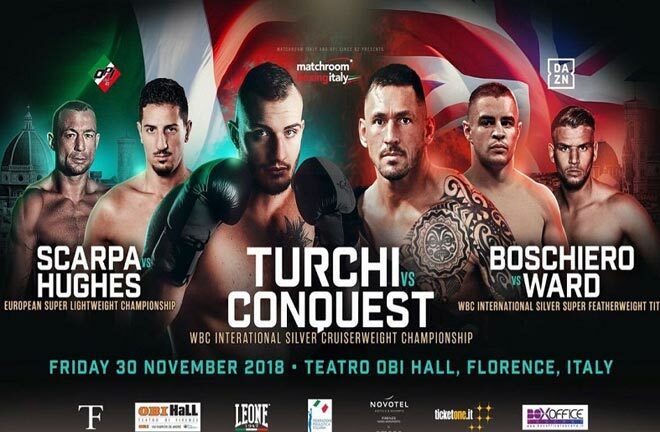 There’s a WBC Silver Title on offer up at Cruiserweight, as hometown hero, Fabio Turchi (15-0, KO11) goes up against Romford’s Tony Conquest (18-2, KO6), who has only fought twice in the last three years. This is the main event according to the fight posters. Turchi has been fed a diet of journeymen thus far is his career, and has knocked out all but four of his opponents. Conquest has only had twenty fights in his nine year career, and has only a 33% knockout percentage. He was stunned in a round in 2012 against Neil Dawson, but rebuilt to outpoint Wadi Camacho in October 2013, and then picked up the Commonwealth Title in February 2014 with a points win over Daniel Ammann . He shipped this in his very next outing, knocked out by dangerous puncher, Ovill McKenzie in five. Since that April 2014 night, Conquest has only fought five times, all against limited opposition. Although Turchi has mixed at a low level thus far, his knockout power is a worry against a man floored several times through his career. I expect the Italian to get the job done by halfway.